A poached egg and some red onion make a great addition. The recipe can be easily doubled, too. 1. Toss the cucumber and lemon juice with a pinch of salt and sugar; set aside. Mix the flours and 1⁄2 tsp salt. Whisk 3 tbsp soured cream with the milk and egg yolk; beat into the flours. Whisk the egg white to stiff peaks and fold in, with the lemon zest. 2. Heat 1⁄2 the butter in a frying pan. Tip in 1⁄2 the batter; spread to a circle 0.5cm thick. Cook over a medium heat for 3 minutes; flip and cook for 2 minutes more. Transfer to a plate; repeat with the remaining butter and batter. 3 Mix the remaining 4 tbsp soured cream with the horseradish; season. 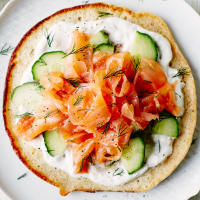 Spread over the blinis and top with the cucumber, salmon and dill.